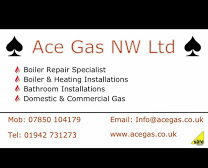 Ace Gas Northwest Ltd - Central Heating Engineer, Plumber based in Wigan, Lancashire. Ace Gas NW Ltd are a Wigan based company working on domestic, industrial and commercial dwellings. We are a specialised heating company that offers unbeatable customer service. We have a team of fully qualified engineers from all aspects from plumbing to commercial gas aspects and operate from our base in Wigan and cover all of the North West.